Regina Wijl, unmarried, lived at 76 Grote Oeverstraat. She was born at Vledder on the 16th of November 1858, as the daughter of Levi Nathaniel Wijl and Martha David Woudstra. Since 1929 she had lived on the Grote Oeverstraat and had always worked as a housekeeper. Until 1937, she worked as a housekeeper at number 64 for Frank Meijer. He was born in 1853 and was the father of Rachel Frank, the wife of grocer Frank on the Hoofdstraat. In 1928 he became a widower after the death of his wife Maria Kan. It was then that Regina moved in, to run the household. After Meijer’s death in 1936, she had to leave the house but remained living in the same street at number 76. Regina was the only Jew living in this busy working-class area; indeed it was a very busy street. 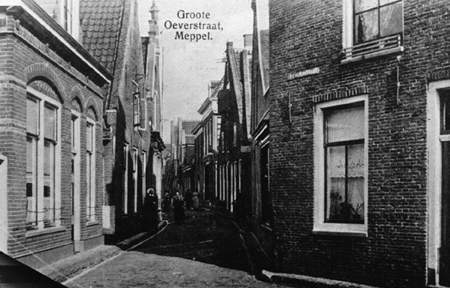 Probably Grote Oeverstraat was one of the most important streets in Meppel, with a great variety in trade and industry. In the alleys there were many one-room flats. People lived next to and behind each other, because at the rear of the houses there were sometimes more houses. In this close-knit working-class district, people shared life’s joys and sorrows. Regina Wijl lived somewhere in the middle of this street. Near her house there were three alleyways. In one street there were five one-room flats, in the second there was a block of four houses and in the third street there were nine houses. In this last street, the widest, lived a couple of colourful men: Koning, nicknamed ‘De Sire’ (his majesty) and Witvoet (a fishmonger nicknamed ‘De Zeedokter’ (sea doctor). The houses in this street, which was demolished, were alternated by a variety of shops. One of them was the dairy of the Jewish Goldstein family, who also had a painting business/ chemistry on the Hoofdstraat. In the window of the side entrance door a prayer roll was put behind glass. Children loved to take it out, but their parents did not allow this. There were also farms and all kinds of other businesses. The street was dominated by the prominent granaries near Kruisstraat and Molenstraat. At the rear of the warehouses, supplies and stocks were unloaded from the vessels and at the front, horse drawn carts and lorries collected the merchandise to be delivered to the customers. Other companies established here were for instance: Stone mason Becker, engine factory Meier and building contractor Geskes. There was even a dispatch company in this rather inaccessible street. The owner, Mr. Pol had a cart, pulled by a small black horse. Sometimes a foal would accompany him while delivering goods in Meppel and the surrounding areas. Quite a few visitors from outside the area would regularly come here. A great attraction was the knife grinder. Regina Wijl probably felt very much at ease in this neighbourhood. What she could not do any more at the age of 83, without doubt her neighbours did for her. As she was an orthodox Jew, the light on the Sabbath was without exception switched on by neighbouring boys. Even in the difficult times of the Second World War, her neighbours supported her without any doubt. Maybe Grote Oeverstraat, so intimate and closed off from the rest of Meppel, was the best street for Jews to live during that awful war. What could the people from this street do for her on the 3rd of October, hide her in one of the other small houses? Difficult, even if Mrs. Wijl had wanted that. She was taken from her home that night just like all the other Jews and taken to the station. The people of the Grote Oeverstraat must have been very sad after her departure. In Westerbork she ‘celebrated’ her 84th birthday, before she left for Auschwitz on the 9th of February 1943, where she died three days later. Regina Wijl lived in the middle of Grote Oeverstraat.